I spent an amazing week in New York and had some incredibly innovative and inspiring meals. I took away a new appreciation for the art of cooking and it makes me want to explore the possibilities the kitchen has to offer even more. It was great to get away and spend some time by myself and explore the city. I got to do all the things that I don’t get a chance to do with my family. I went to a few museums, did some shopping, took in a Broadway play and even had a few cocktails. With temperatures expected to hit a 100 this week my desire to turn on the oven is nonexistent. 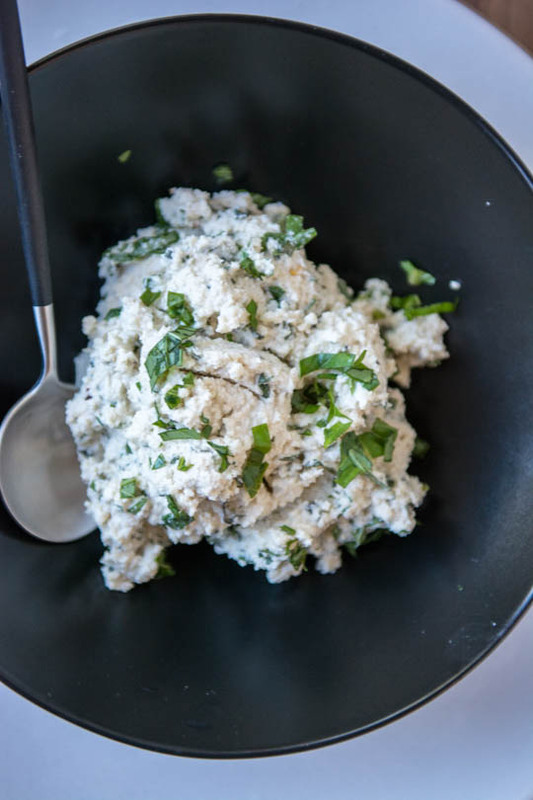 I’ve come across a lot of recipes on Pinterest for vegan cashew ricotta but never it never interested me much. Trying to explore more dairy free versions of our favorite foods led me to revisit the recipes and come up with a no-cook version that we could eat without having to heat up the oven. I was so surprised at how the texture and flavor of the cheese really simulated ricotta. 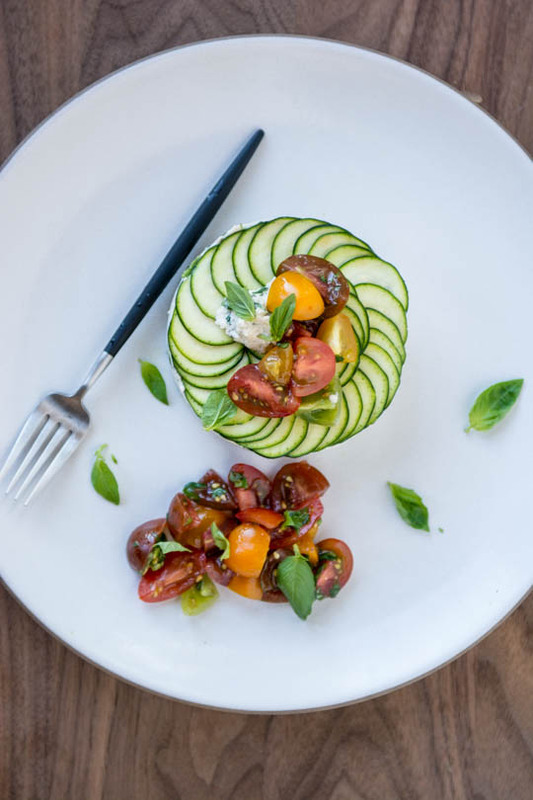 The addition of the garlic and vinegar really gave it a nice depth of flavor and I combined it with avocados, thinly sliced zucchini and some simple marinated cherry tomatoes. This is a dish that I can see myself making over and over again. If you don’t feel like going through the motions of molding the lasagne, I also plated a version that I just stacked all the layers on top of each other and I think I might actually like the way it looked even better and it only took minutes to put together. The dish comes together really quickly besides letting the zucchini drain a bit and the cashews soak it can be put together in just a few minutes. Soak the cashews in enough water to cover for at least two hours or up to overnight. Drain and place in the bowl of a food processor or high-speed blender. Add the lemon juice, garlic, sherry vinegar, chili flakes and salt and pepper. Add just enough water to get the mixture moving easily. Process on high until the mixture is smooth. Stir in the basil and set aside. 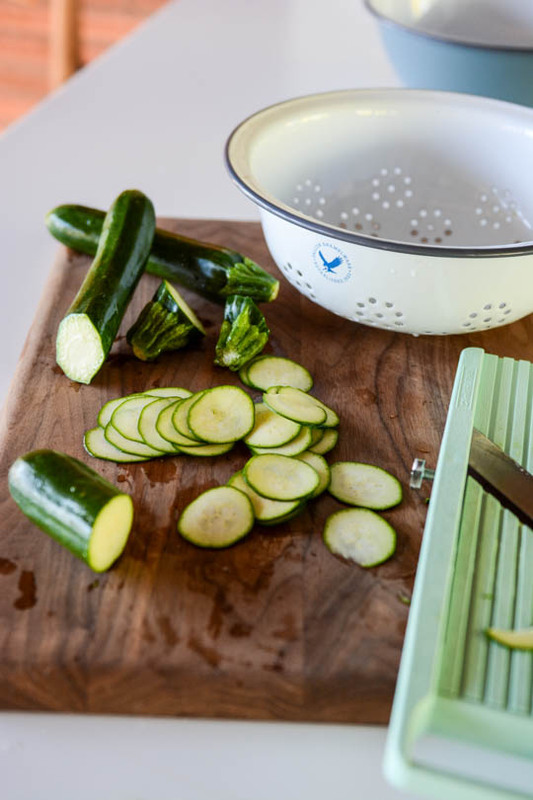 Cut the ends off the zucchini and using a mandoline, food processor or very sharp knife slice into very thin rounds. Sprinkle with the salt, place in a colander and let drain for 20-30 minutes until ready to assemble. Combine the diced avocado, basil, chives, garlic and olive oil in a small bowl. Toss well and season with salt and pepper. 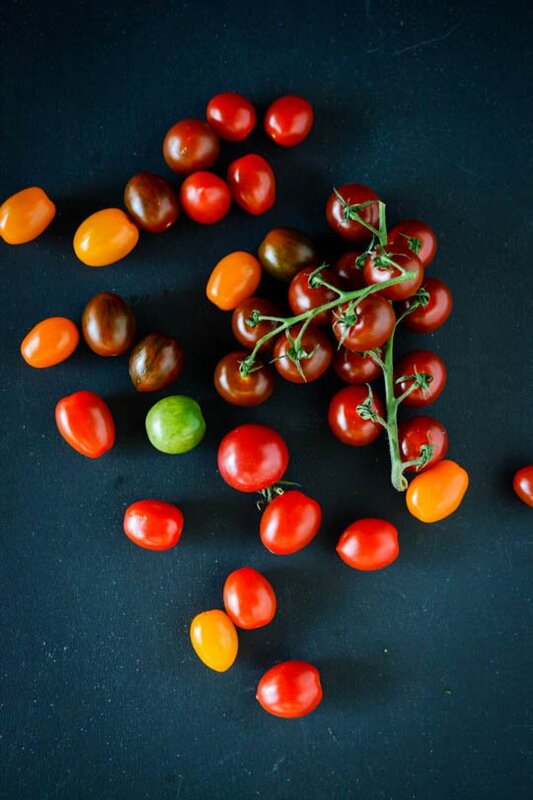 Combine the diced tomatoes,basil and olive oil in a small bowl and season with salt and pepper. 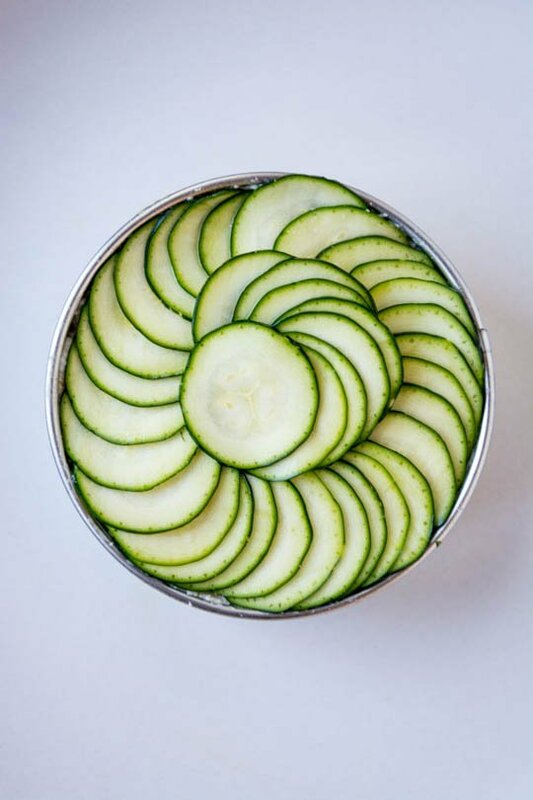 Using a large round cookie cutter or mason jar lid line the bottom of the mold with the zucchini, overlapping the rounds in a circular pattern until the entire bottom is covered. 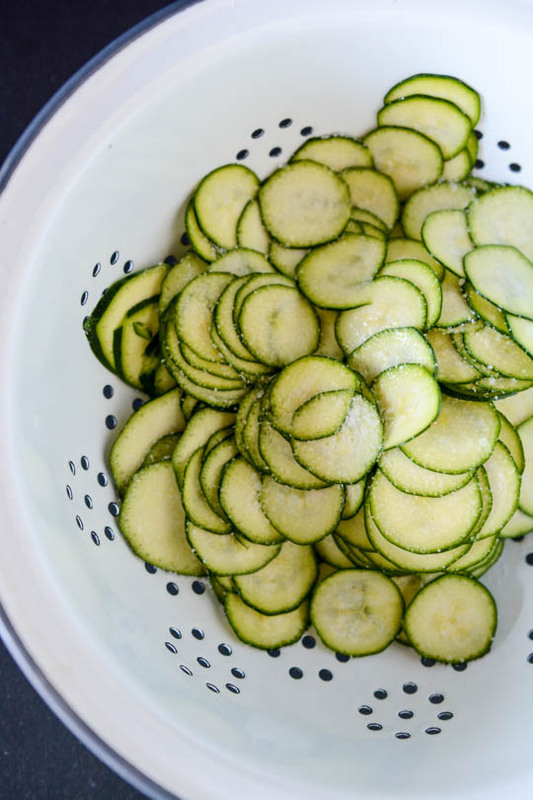 Spread a tablespoon or two on top of the zucchini and spread it around in an even layer. Top with another layer of zucchini and then add a few tablespoons of the avocado mixture. Repeat with another layer of zucchini and layer of cheese. 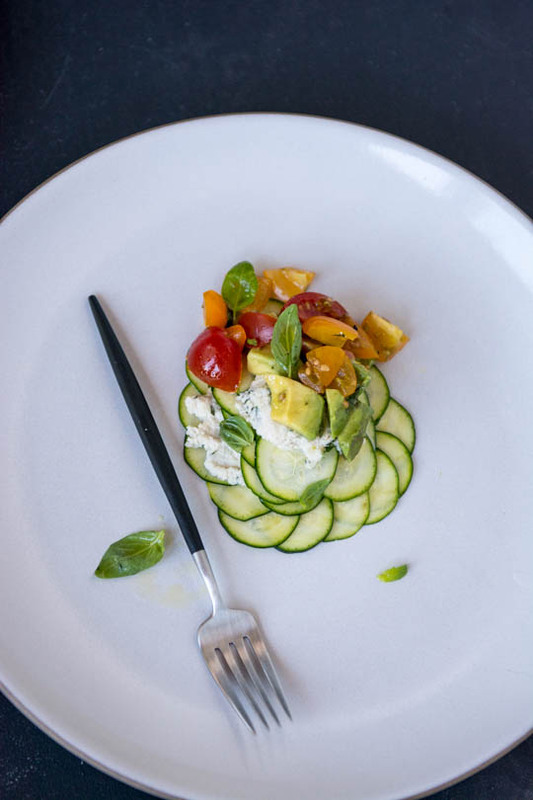 Finish the top with a final layer of zucchini. 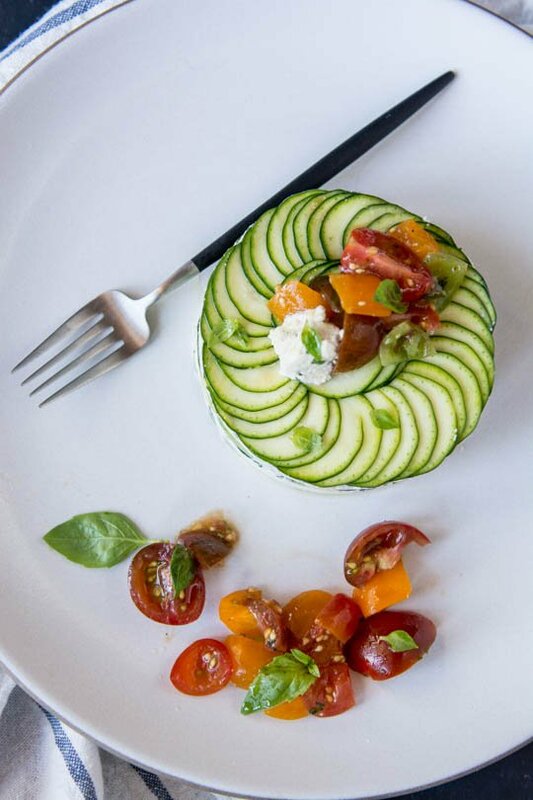 Remove the mold and garnish the top with some of the marinated tomatoes and a dollop of the cheese. 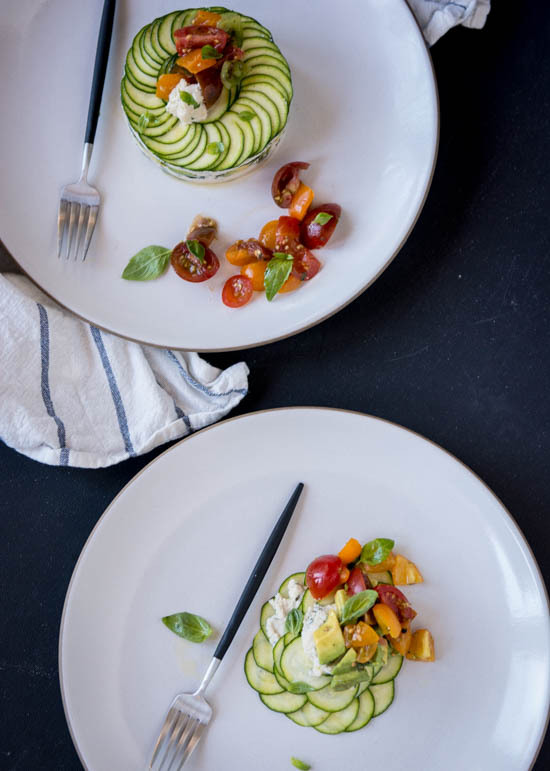 Serve with additional tomatoes on the side and garnish with the additional basil. Alternatively you can freeform the layers by just laying them out on the plate and building the lasagne in the same manner as in the mold. This is so pretty and fresh! 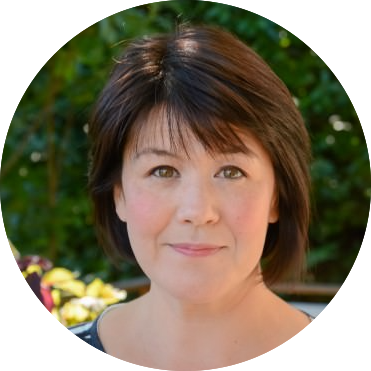 I’m a big fan of cashew cheeses – they’re surprisingly similar to their dairy counterparts. 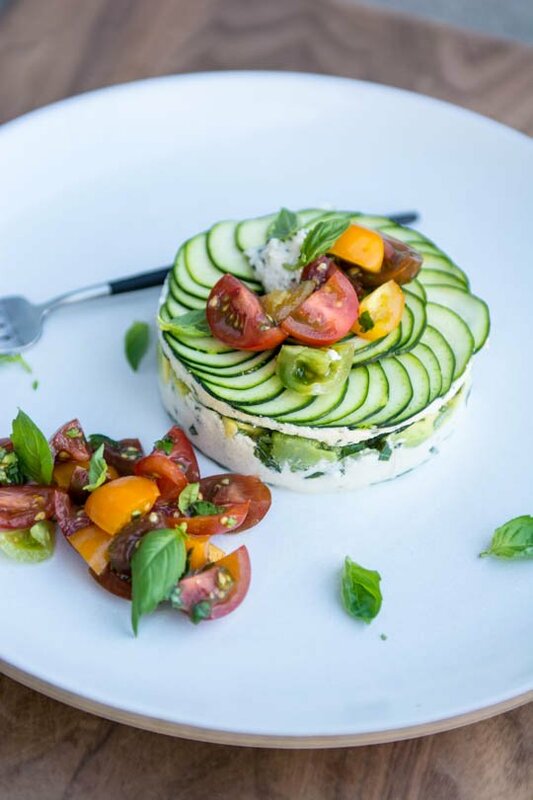 I happen to have all these ingredients on hand and will definitely be trying your version of raw lasagne! I am all about presentation in my food. The better it looks, the more I want to eat it! With our temperatures hitting 100 degrees this week here in Portland, this will probably end up on the dinner menu!